JGarden Description: Begun in 1911, this is one of America's oldest and most mature Japanese gardens. Things Japanese were fascinating to many Americans in the early years of the 20th century. Since the appearance of Commodore Perry's black ships in Japan in 1868, small amounts of information about Japanese culture began to trickle out to the rest of the world. In continental Europe, Japanese painting, textiles, prints, design and architecture had a profound impact in the worlds of art and design, culminating in the Japonisme movement near the end of the century. The Impressionists, Tolouse Latrec, Klimt and the other Art Nouveau artists in Austria and Paris, and numerous others experienced profound shifts in their thinking when they encountered what was, for them, a fresh new culture from Asia. The cultural influence was felt much more gradually on the other side of the Atlantic. But by early in the 20th Century, there had been several international expositions in Philadelphia, Chicago, San Francisco and St. Louis. Each of these expos had Japanese pavilions and gardens at which the Americans marveled. Several significant books also appeared in America at the end of the 19th century or early in the new century, stirring the national imagination. Edwin Morse publishedJapanese Homes and their Surroundings in 1886. This book influenced two Pasadena architects, Greene and Greene, to create a new aesthetic of architectural structure related to the landscape that had enormous impact on the architectural style of southern California. Josiah Conder's book, Japanese Gardening in Japan, published in 1893, was also enormously influential. As a result of these contact and several other factors, Japanese gardens became the height of fashion in Los Angeles, for those who could afford them. Many were small tea gardens, but in the Los Angeles area, two were built before 1910 that were the size of a large estate. One was by Myron Hunt, Huntington's own architect. A second was by George T. Marsh, proprietor of the famouse tea garden at the 1894 San Francisco exposition. When he returned to Pasadena, he decided to build a commercial tea garden in Pasadena. The effort was extravagent and Marsh spared no expense. Thus, by 1910, Huntington and Hertrich had two local examples, all of the work being done by Greene and Greene and some books on the subject. (An original copy of the Conder book was found in Hertrich's library). 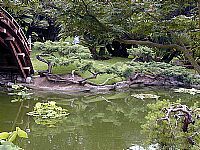 They began to get ideas of their own for a Japanese garden on the grounds of the Huntington estate. It's not clear, but there may have been some other motivations as well. Huntington seemed to be in a great hurry to get the garden built by 1912, when he occupied the residence. It is possible that he may have intended the garden as a gift for his bride and second wife, Arabella, whom he married in 1913.